All species have restricted distributions. Yet a joint coherent theory explaining the span and borders of species' ranges has been missing both due to the complexity of the problem and the disparate traditions in ecology and evolution. Jitka Polechová provides a general, testable prediction for formation of species' range margins. The theory includes both population and evolutionary dynamics, and elucidates the role of dispersal for adaptation across a species' range. Dispersal has conflicting effects: on the beneficial side, it increases the genetic variation that is necessary for adaptation and counters the loss of genetic diversity due to genetic drift. However, dispersal also carries a cost: it may swamp adaptation to local conditions. This interplay is crucial for the evolution of a species' range. The novel theory demonstrates that adaptation across a species' range depends on two dimensionless parameters: i) the fitness cost of dispersal – a measure of environmental heterogeneity, and ii) the strength of genetic drift – a measure of the reduction of genetic diversity. The more heterogeneous is an environment, the more challenging it is to expand into, and the lower the genetic diversity, the more limited is the scope for potential adaptation. 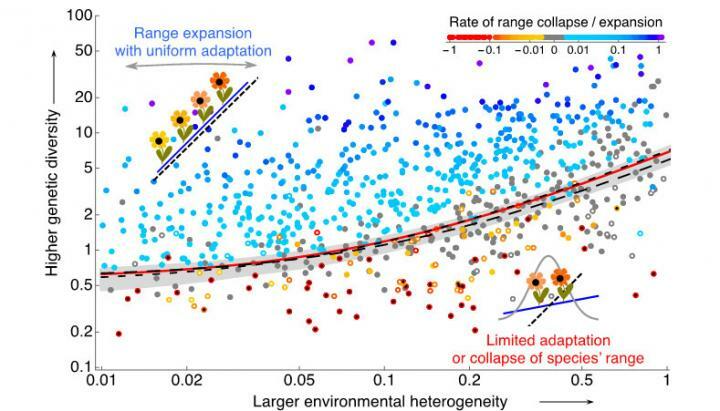 Together, these two parameters define an expansion threshold: adaptation fails when the number of individuals accessible by dispersal within one generation is so small that genetic drift reduces genetic diversity below that required for adaptation to a heterogeneous environment. This threshold provides a testable prediction for the formation of a range margin and for the collapse of a species' range. Polechová J. (2018) Is the sky the limit? On the expansion threshold of a species' range. PLoS Biology.